Tuition and general fees represent payment toward the maintenance, operating, and instructional costs of the College. Students are charged per credit hour for each semester they are enrolled in the institution. A student enrolled in 12 or more semester credits is considered a full-time student for tuition purposes. Non-credit developmental courses are considered part of the course load in determining full-time status. Current tuition rates, housing costs, and fees may be viewed on the College website (www.rbc.edu) or by calling the Cashier’s Office. Fall semester charges will be billed on or about the beginning of July for those students who have completed the registration process, and payments shall be due on or about the first week of August. Spring semester charges will be billed on or about the beginning of December for those students who have completed the registration process, and payments shall be due on or about the first week of January. Bills will show all charges at the time the bill is generated, along with any personal payments received, or Financial Aid received or pending. Credit will be given for pending Financial Aid if all Financial Aid requirements have been met. It is the student’s responsibility for ensuring all necessary actions have been taken to receive his/her financial aid awards. If a student has questions on the Financial Aid section of the bill, he/she should reach out to the Financial Aid Department. Credit will be given for pending outside scholarships only if the student has provided RBC’s Financial Aid department with the official notification of the award(s) prior to the scheduled billing dates. Unless specified by the agency supplying the scholarship, all outside scholarships will be evenly divided between the fall and spring semesters. Every effort is made to have paper bills sent to the student’s address on file, however students who register late may only receive electronic bill notices. Automated emails with Student Account Statement/Bill attachments are sent out weekly to students who are registered up until the tuition due date. Electronic bills are sent to both personal and RBC email addresses on file. Additional bills and/or collection notices may be sent after the tuition due date to addresses on file. See the Collection Policy section for collections notifications and additional information. It is the student’s responsibility to make certain that all permanent, local, and personal email addresses are current in our system. Failure to receive a billing statement will not waive the requirement for payment by the due date. Students who do not receive bills, and the due date is approaching, should review their Self Service Banner account balance information by logging onto http://statesmen.rbc.edu/login. Tuition and fees are payable in full in advance of each semester. Payments must be received by the Cashier’s Office before students will be allowed to complete registration. The College accepts cash, checks, VISA, Discover, and MasterCard. Automated monthly payment plans are also available and students must enroll in the plans prior to the start of each semester. When a check is returned by the bank for any reason, the student’s academic record will be encumbered and the student will not be permitted to complete registration until tuition, fees, and service charges are paid in full. Copies of Section 23-7.4 and Section 23.1-503 (effective October 1, 2016) of the Code of Virginia are available in the College Library. To become eligible for in-state tuition, an independent student shall establish by clear and convincing evidence that for a period of at least one year immediately prior to the date of the alleged entitlement, he was domiciled in Virginia and had abandoned any previous domicile, if such existed. To become eligible for in-state tuition, a dependent student or unemancipated minor shall establish by clear and convincing evidence that for a period of at least one year prior to the date of the alleged entitlement, the person through whom he claims eligibility was domiciled in Virginia and had abandoned any previous domicile, if such existed. Domiciliary status shall not ordinarily be conferred by the performance of acts which are auxiliary to fulfilling educational objectives or are required or routinely performed by temporary residents of the Commonwealth. Mere physical presence or residence primarily for educational purposes shall not confer domiciliary status. A matriculating student who has entered an institution and is classified as an out-of-state student shall be required to rebut by clear and convincing evidence the presumption that he is in the Commonwealth for the purpose of attending school and not as a bona fide domiciliary. Evidence of intent to establish Virginia domicile may include, but is not limited to voting registration, state to which income taxes are filed or paid, property ownership, military records, employment, auto registration, driver’s license, and any other social or economic relationships with the Commonwealth and other jurisdictions. The tuition rate for spouses and dependents of active military personnel will be in accordance with applicable state laws and statutes. The Dean of Enrollment Services shall make initial determination of residence at the time of admission based on completion of the Virginia In-State Tuition Form. Additional documentation may be required. Students unable to provide the necessary information shall be classified as a non-resident. to the Dean of Finance and Administration. This appeal must be in writing and the Dean of Finance and Administration shall respond in writing within five working days of the receipt of the appeal. Any party aggrieved by a final administrative decision shall have the right to review in the Circuit Court of Dinwiddie County. A petition for review of the final administrative decision shall be filed within thirty days of receiving the written decision. Per the Code of Virginia section 2.2-4805, students and families are hereby placed upon notice that failure to pay in full at the time goods or services are rendered or when billed will result in the imposition of a late fee of 10% of the balance due. Returned checks will incur a handling fee of $50. If the account is referred for collection to an attorney or to a private collection agency, then the student will be liable for all attorney’s fees, interest or additional collection costs. Request for or acceptance of goods or services will be deemed to be acceptance of these terms. To prevent the possible assessment of late payment fees, students must pay all calculated charges on, or before, the semester due date or the date a charge is incurred (whichever occurs later). If tuition has not been paid by the established due date, secured with adequate financial aid, or an automatic payment plan is not in place, students will be charged a late payment fee of up to 10% of the outstanding balance (not to exceed $100) as prescribed in 2.2-4805 of the Code of Virginia. Failure to receive a bill does not waive the requirement for payment when due and will not prevent the application of the late fee. If tuition has not been paid by the due date, students may be dropped from his/her courses for non-payment. Communications will be sent to students in advance of being dropped. It is the student’s responsibility to make certain that all permanent, local, and personal email addresses are current in our system. Richard Bland College’s main form of communication for currently enrolled students is through the RBC email address. Failure to review, open, or check the RBC email Inbox, Spam, or other folders will not prevent classes from being dropped for non-payment. Parking Fee: this charge stems from a parking ticket administered by the Richard Bland College Police department for failing to display your parking decal, parking in an incorrect lot, etc. Distance Learning fee: charged per credit for courses containing online instruction. Distance learning courses include: 1) those offered online only, 2) those offered in a “hybrid” format (online and in-seat), and 3) those offered in a livestream format. The distance learning fee is $25 per credit hour, not to exceed $90 per course. Refund checks are generated when a student has a credit on his/her account for the semester. Credits may occur because of overpayments in grants, scholarships, loans, or personal payments made in cash, check, or credit cards. All refund checks will be made out in the student’s name, unless the overpayment is caused by a Parent Plus Loan. For overpayments in Parent Plus Loans, the refund check is processed in the parent’s name. The refund process may take up to 14 calendar days from the date of the overpayment. Refunds are processed in batches, according to the overpayment dates. Once a batch is complete, communications will be sent to students’ email address and Learner Mentors indicating the refund check is available for pick up from the Cashier’s Office with a valid ID. Parent Plus refund checks are mailed out to the address on file. Student refund checks are held in the Cashier’s Office for approximately two weeks before being mailed out to the address on file. It is the student’s responsibility to update address information. Inaccurate information may cause a delay in receiving the refund check. The following information is not intended as legal or tax advice. Please confer with a personal tax advisor or the Internal Revenue Service to determine your eligibility for education tax credits. The Taxpayer Relief Act (TRA) of 1997 created tax benefits for families or students who are paying for higher education or repaying student loans. 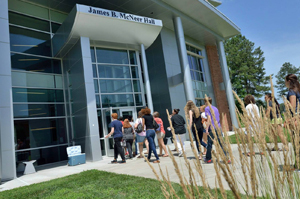 Through Richard Bland College, students, or the persons who can claim them as dependents, may be able to claim an education credit on Form 1040 or 1040A, only for the qualified tuition and related expenses that were actually paid during a Calendar Year. For each calendar year enrolled, each student will be mailed a Form 1098-T, or notified to view the form available in Banner by January 31 on which to report the required information to the Internal Revenue Service.